It is a great honor and privilege for me to have been elected by the members of TFCC as your President for the 2-year term from 2017 to 2019. The election took place during the AGM meeting in Bangkok, 28 September 2017. Before updating you with the various matters which might be of interest to you, I would like to acknowledge the great work and achievements of my predecessor, President Pornpracha Wattanakijsiri. During his leadership TFCC took very positive steps to serve our members more professionally and efficiently. Now this work is going to continue as we are heading towards a kind of “transformation” of TFCC’s operations. TFCC’s new board of directors realized, that it is the time to change the direction of TFCC to safeguard its existence in the long run, but more importantly to better support our members in all matters related to addressing member companies’ genuine business challenges in Thailand. TFCC is now moving from the role of an “event organizer” to become a “facilitator” of professional services, which should bring a positive impact to member companies’ businesses. 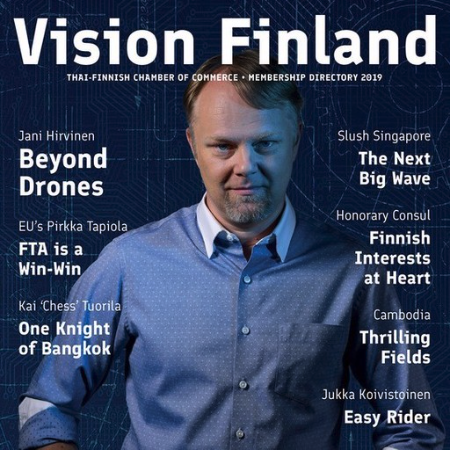 TFCC website contains more detailed information about our new service offering, but in a nutshell TFCC is simply utilizing its unique position in the Thai-Finnish business ecosystem for the benefit of all members. Another new element in our operations is the closer co-operation with other Nordic chambers. This new “Nordic Product” will give new opportunities for certain local and Nordic companies who wish to reach the entire Nordic business community in Thailand in a much more coordinated and efficient way. For the Chambers this will create a new potential revenue stream and thus contribute to each Chamber’s critical financing. 2017 has been again a tough year economically and we truly appreciate the support of our members and partners, who have continued their support for TFCC. We look forward to building a stronger and more sustainable TFCC together. Finally, I wish all TFCC members and partners a promising, prosperous and peaceful time ahead in Thailand.